Since the field station was established in 1988, numerous wild animals have moved in, making the 20 hectare area of trees, bushes and perennial grass their home. The field station has no permanent water hole, but many desert animals can survive solely on the moisture from the vegetable matters or smaller animals that they feed on. One such inhabitant of the field station is the desert monitor [varanus griseus]. Related to the Komodo dragon (the largest monitor lizard in the world), the desert monitor can measure up to 130 cm in length. The body is long and robust, with sturdy limbs and a powerful tail which can be used liked a whip in defence. Colouration can vary from yellow to orange with black bands running across the body and tail. As the desert monitor ages, its colour and markings fade and become lighter. Active during the day, the desert monitor emerges from its burrow in the early morning, basking in the sun in order to raise its body temperature. When sufficiently warmed, it begins to track down prey. The desert monitor feeds on small mammals, birds, eggs and insects and will even tackle more challenging prey such as hedgehogs, tortoises and venomous snakes. Eden believes that every species has a purpose; both plants and animals. 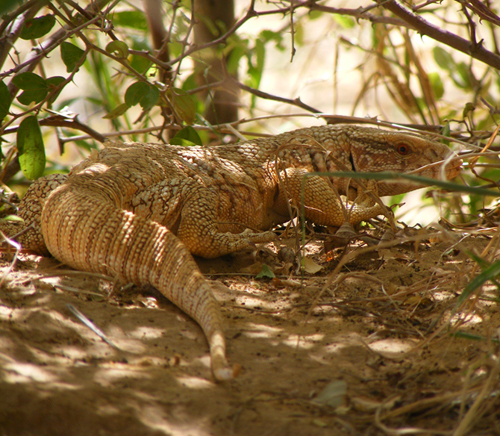 The desert monitor is one of many animals that have moved back into the Tanout area after the establishment of numerous Eden trees. It’s presence helps reduce the level of snakes and rodents, which have previously caused the villagers a lot of trouble. The village chief of Dalli (the village neighbouring Eden’s field station) recently reported that the number of snakes and rodents have decreased dramatically since the arrival of Eden and the establishments of trees and bushes in their area. Prior to the arrival of Eden, the villagers used to cut down vegetation in order to chase away venomous snakes and crop-eating birds, but the environmental consequences were disastrous. Today, prey animals move in where farmers are transforming their barren fields into Eden Gardens, keeping the number of snakes and rodents at bay in a natural way. Eden welcomes biodiversity and we are looking forwards to the reappearance of more wild animals in the area!